Botanical Name: 1. Atractylodes lancea (Thunb.) DC. ; 2. A. chinensis (DC.) Koidz. ; 3. Atractylodes japonica koidz. ex Kitam. Part Used & Method for Pharmaceutical Preparations: The rhizomes are dug in spring or autumn; those gathered in autumn are better. After the fibrous roots have been removed, the rhizomes are cleaned and dried in the sun, soaked in water and cut into slices. The raw slices are then fried until yellowish in color. 1. Dampness blocking the spleen and stomach manifested as epigastric distension and fullness, poor appetite, nausea or vomiting, lassitude and sticky tongue coating: Atractylodes rhizome (Cangzhu) is used with Magnolia bark (Houpo) and Tangerine peel (Chenpi) in the formula Pingwei San. 2. 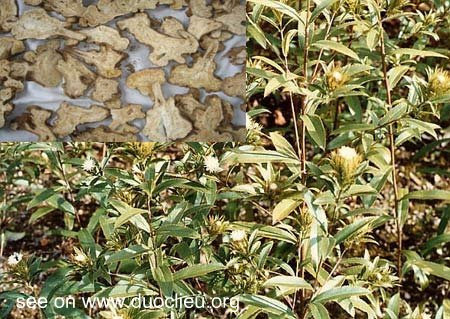 Wind-cold-damp obstruction syndrome manifested as swollen and painful knee joints and weakness of the lower limbs: Atractylodes rhizome (Cangzhu) is used with Chaenomeles fruit (Mugua), Mulberry twigs (Sangzhi) and Pubescent angelica root (Duhuo). 3. Exterior syndrome due to invasion by exogenous pathogenic wind, cold and dampness manifested as soreness and heaviness of the limbs, chills, fever, headache and heavy sensation in the head: Atractylodes rhizome (Cangzhu) is used with Ledebouriella root (Fangfeng) and Asarum herb (Xixin). 4. Downward flow of damp-heat manifested as swollen and painful knees and legs and weakness of the lower limbs: Atractylodes rhizome (Cangzhu) is used with Phellodendron bark (Huangbai) and Cyathula root (Niuxi) in the formula Sanmiao Wan.